Greek Prime Minister Alexis Tsipras addresses the European Parliament in Strasbourg, France, July 8, 2015. Debt-wracked Greece asked its European neighbors for a new three-year bailout Wednesday, pledging to "immediately implement" tax and pension reforms. Greek Prime Minister Alexis Tsipras told the European Parliament in Strasbourg that Athens would produce "new concrete proposals" by Thursday to meet the demands of European leaders who've grown weary of Greece's debt crisis. With his country's banks near collapse and running out of cash, Tsipras said he is confident of meeting an end-of-the-week "final deadline" European leaders have given him to reach a bailout deal, and a deal that will keep his country in the euro currency union. Tsipras was greeted by both boos and cheers as he spoke to the European Parliament Wednesday – just hours after the end of an inconclusive summit in Brussels and just hours before a Thursday deadline for Athens to deliver a credible reform plan to fellow eurozone members. He said Greeks need a sign that there is light at the end of a difficult tunnel, hope of an exit to the crisis. Christian Odendahl, chief economist for the London-based Center for European Reform, believes there is still a chance for a deal that will also pass muster in Germany, Greece’s biggest creditor. German Chancellor Angela Merkel said Greece cannot just offer a short-term fix. Odendahl said, “I think the probability for an agreement is still relatively high, because no side really wants Greece to leave the eurozone, to default and so forth. "Angela Merkel is in a very difficult situation. But she still has enough political capital to get a deal that she deems appropriate and feasible through the German parliament. I have no doubt about that," he added. In a sign of just how dire the situation has become, European leaders have begun making preparations for Greece to leave the eurozone, which would make it the first to leave the currency bloc in its 16-year history. "The commission is prepared for everything. We have a Grexit scenario, prepared in detail," said European Commission President Jean-Claude Juncker. European Commission President Jean-Claude Juncker, left, gestures at the European Parliament in Strasbourg, eastern France, July 8, 2015. Analyst Guillaume Xavier-Bender of the German Marshall Fund’s Brussels office said a Greek exit would put the eurozone in uncharted waters, with repercussions for other members of the monetary union. “The biggest consequence will be a political one, to my sense, which is that Europe is now considering openly the fact that a country that has entered the eurozone may leave under certain circumstances," Xavier-Bender said. "Does that mean it can reenter the eurozone at some point? Is it a permanent withdrawal? 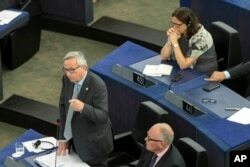 Does a country exiting the eurozone have to leave the EU (European Union)?” he asked. Greece defaulted on its $1.8 billion loan payment to the International Monetary Fund last week when European finance ministers refused to extend its bailout that would have allowed Greece to pay the IMF. Greece said it has suffered enough with spending cuts, tax hikes and other tough conditions that the EU has imposed in exchange for a bailout. A supporter of the No vote waves a Greek flag after the referendum's exit polls at Syntagma square in Athens, Sunday, July 5, 2015. Greek voters rejected more austerity in a referendum earlier this week. While some Greeks say it is essential for the country to remain a part of Europe economically, "no" voters accused the EU creditors of humiliating and enslaving them. Meanwhile, many Greek banks are closed and withdrawals at cash machines are limited to just $67 a day. Store shelves are rapidly emptying and gas stations drying up. It is unclear what will happen next if no deal is struck. Greece is rapidly running out of cash, and the limited funds it is receiving now from the European Central Bank may dry up altogether. “The current state of the Greek banking system, as it is closed and withdrawals are limited, is a huge problem for the economy," economist Odendahl said. "Basically, it comes to a standstill at some point and that has a huge impact on the population. So the longer this state of affairs lasts, the harder it will be on Greece," he added. If Greece and the EU cannot come to terms, Greece could be forced out of the eurozone and return to its old currency, the drachma – money that some outside Greece could refuse to accept. Greece's economic troubles began in earnest in 2009 when it was revealed that the old conservative government badly underreported the country's debt. The revelations came during the same time the global recession began to worsen. Greece was forced to turn to European and international leaders for a bailout to prevent bankruptcy. Lisa Bryant contributed to this report from Paris.